WHO WE ARE WE’RE CHANGING THE WAY YOU LIVE IN YOUR HOME Meet Jaclyn and Donnie Boutwell, a powerhouse duo who own Media Systems, a luxury home technology integration firm in Houston. As home technology advisors, they design and build the most advanced and easy to use automation systems around. Jaclyn and Donnie believe that the technology in your home should be easy to use, beautifully designed and unbelievably reliable. With their team, they provide a white glove luxury service to a distinguished clientele. Donnie’s Uncle, Steve Driskell, founded Media Systems in 1980 and over the years the family business has developed a solid relationship with homeowners, architects, designers and builders in Houston. In new construction they help architects, builders, and designers navigate through constantly evolving technologies. In existing properties they can modernize systems without having to start over. They can make it work. Donnie and Jaclyn are the ‘go-to’ experts for home technology. They’re often asked what it’s like to work together. Jaclyn says, “We always worked well together. Working together in business has just been a natural thing for us.” They have found a platform among their peers to help other couples learn how to make a marriage sizzle. After ten years producing records on music row in Nashville, Donnie knows a thing or two about sound. His experience in construction management, and digital music led Donnie to create audophile listening rooms at Media Systems. Today he spends most of his time managing the business and programming Creston systems. Donnie has a Bachelor degree from University of Houston in Radio and T elevision Production with a minor in Percussion Performance.Donnie specializes in design working with architects, designers, builders and home owners to create systems that bring form and function together. With a background in artistic design and professional photography, Jaclyn has an eye for detail. She makes sure that technology blends seamlessly into the visual design of the home. Jacyln works with homeowners and interior designers to be sure that the technology in the home doesn't distract from the archetictural or design elements. Whether you're choosing motorized shade fabrics, deciding on lighting fixtures or even have a TV in that space, Jaclyn has the discerning eye to make your design aesthetically pleasing. In addition to our being a technology designer, she is also our Chief Financial Officer. Most consumers know that high tech industry technology is constantly evolving and improving our lives. However, to create a truly high-end smart home, it takes a team of professional automators experts to facilitate living in luxury. While DIY is a popular option, Media Systems saves money, time, and eliminates guesswork. Media Systems uses a holistic lifestyle/ design approach to create synergy between all the subsystems in a home as well as the needs of each room in the house. Take control of your home with Media System's preferred technology: Crestron. We offer a wide range of products that allow for intelligent command of your residential audio/video, lighting, security, and thermostat systems. Business environments can also be enhanced through our partnership with Crestron products. Custom Living Experiences Media Systems offers custom “experiences” that can be programmed for your time of day, functions, mood, or entertainment needs. Imagine automating your lighting, music, room temperature, and more with one single control interface. Envision a “morning experience” where you wake up to coffee brewing, jazz tunes playing, and the shades already are drawn for a weekend brunch at home. All this is possible and more with our home automation technology partners, Creston and Josh AI. Josh AI is a voice controlled home automation system activated by Artificial Intelligence that works with the bestin-class luxury smart home products. Imagine giving complex voice orders to Josh being as natural as chatting with your family. To make a home truly connected, voice control activations are essential to your automation plan. Full-Service Design/Build Capabilities Donnie and Jaclyn know that prospective home buyers are connected to their phones and technology more than ever. Smart homes are quickly becoming the 'new normal.' Media systems can help your clients synchronize all the already existing plans and layouts for your build; lights, thermostats, door locks, garage doors, security devices and more. TheÂ most affordableÂ and easiest way to install a new home automation system is during the planning and building phase. ART DECO LANDMARK TRANSFORMED INTO PREMIER HOME THEATER SHOWROOM Houston-based Media Systems Inc. acquired this 10,000 square-foot Prohibition Era landmark in 2002. Now a showroom/demo space, there are multiple home theaters that vary in size, built to show off the versatility of Crestron solutions. The main theater features a large flagship Sony® Home Cinema Projector powered by a Crestron remote processor and DigitalMedia. The upstairs living room is a comfortable space that’s a more common installation for our homeowners. The smaller theater serves as a primary showroom. In addition to being a DM® endpoint, the space specifically works with an older projector to show how Crestron technology can control both new and older equipment. Each space shows off the flexibility and intricate features of Crestron technology and its ability to work seamlessly with thirdparty products such as Amazon® AlexaTM and Josh.ai voice control. 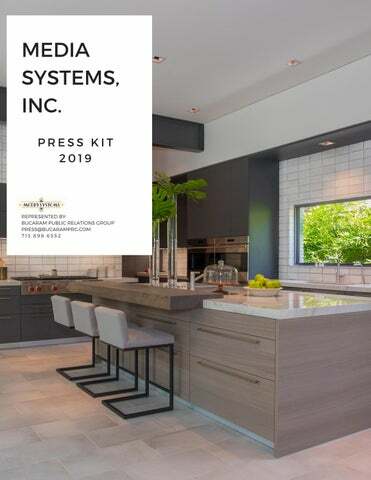 Media Systems Press Kit authored content and managed creative vision for a client of the Bucaram Public Relations Group.